After the adrenalin rush from the Asiatic Elephant chase at the Bandipur National Park, we were slowly settling down while roaming the forest in search of wildlife and birds. Soon it was time to head back. We took a road that leads to the park gates and when we were about a kilometer from the exit, a Wild Dog, (Dhole) crossed the safari road. We are always excited to see this endangered social hunter since we know that Wild Dogs live and hunt in packs and there would surely be more than one. We moved a little forward to try and spot the pack. 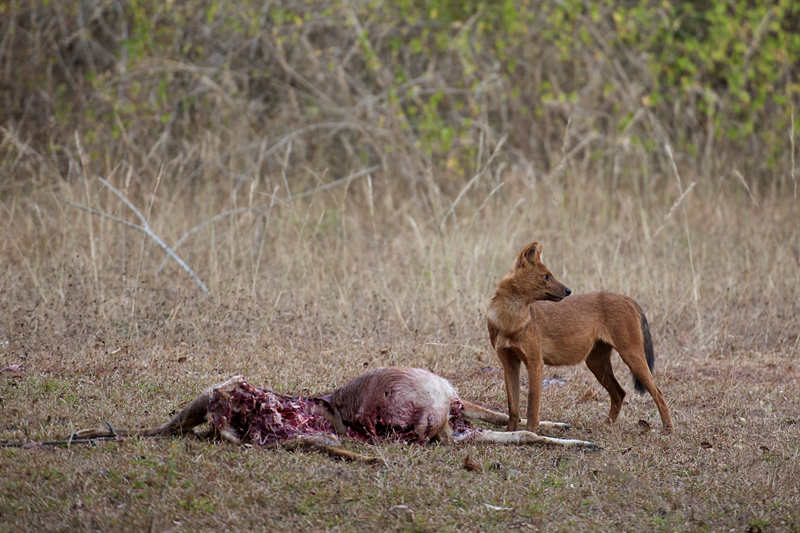 And we saw two more Wild Dogs standing beside a Spotted Deer carcass. 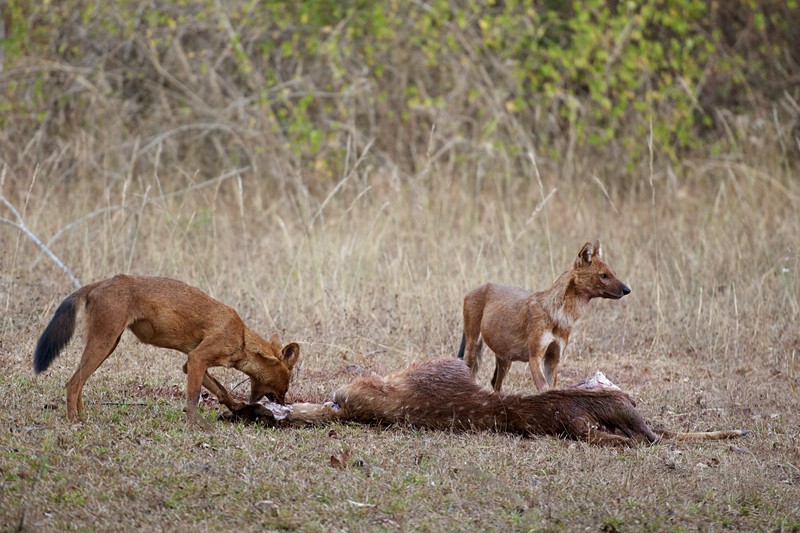 We quickly realised that these three Dholes would have brought down the Spotted Deer. Then as per the pecking order, the dominant male – the Wild Dog that crossed the safari road, would have first finished eating and then moved into the distance to keep watch, while the remaining two took turns to feed (below). 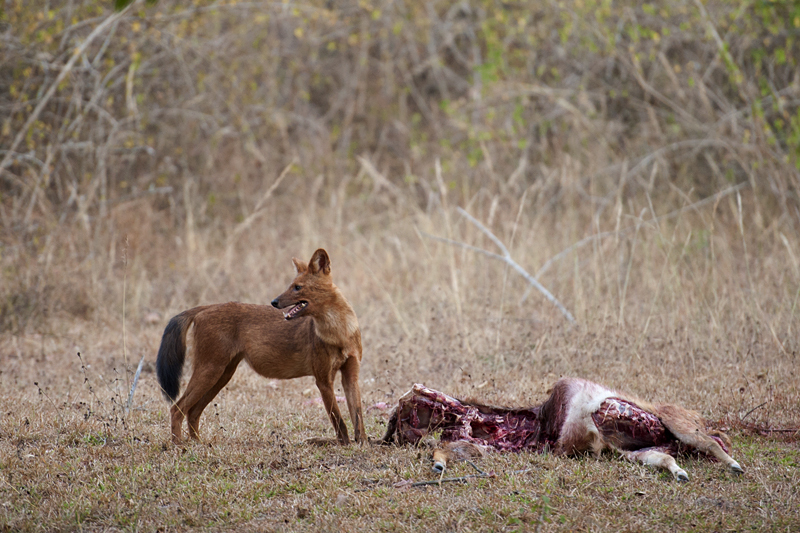 The two Dholes took turn to keep watch while the other hurriedly fed (above) on the Spotted Deer carcass. Given that both the Dogs kept looking in the same direction, it was clear that there was a rival predator, maybe a Tiger or a Leopard hidden in the lantana, stalking them from a distance. Given the proximity of a rival, the Dholes starting feeding in a frenzy as portraited in the feature picture of this post. 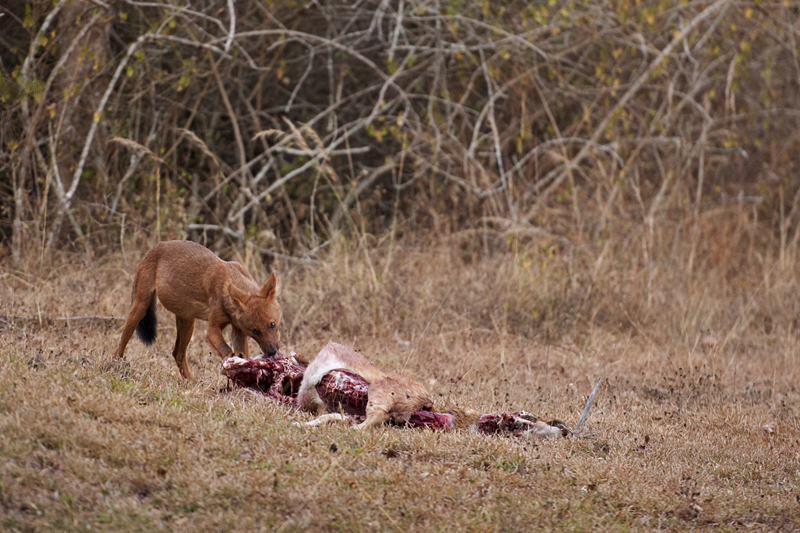 A little later, one of the Dholes finished feeding and left the kill. 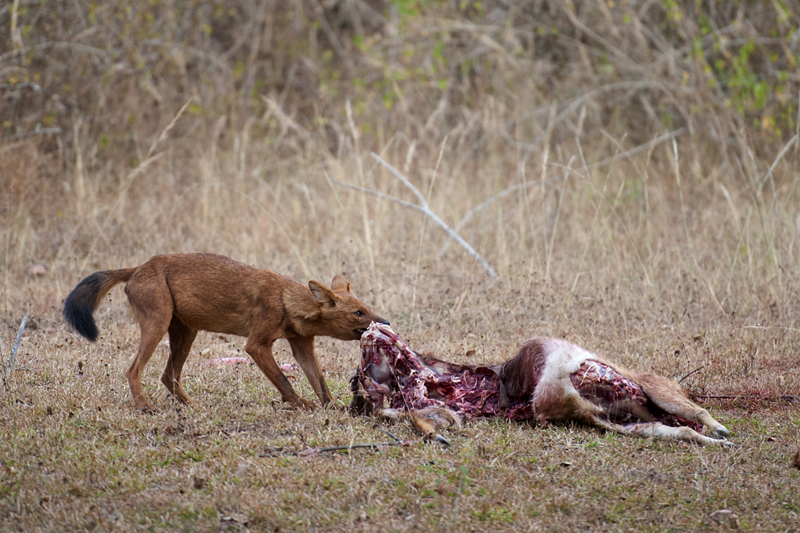 This left a nervous lone Dhole still feeding on the carcass. After a while, it looked up in the direction of the invisible threat (below). I guess it did not like what it saw, since it started feeding more hurriedly (above). After a few anxious minutes of feeding, the Dhole looked up (below) at his fellow mates, waiting at a distance. They exchanged glances and that was it. It looked like the decision was made to move on. With the light fading fast, the last remaining Dhole pulled the carcass (above) towards the lantana’s edge, probably in an attempt to hide it. But since it was too heavy, it unwillingly left the carcass close to the lantana and ran to join the other pack mates. We waited for a few more minutes to see if the invisible rival predator would show up, but it was too late and we had to rush back before the park gates got shut for the night. 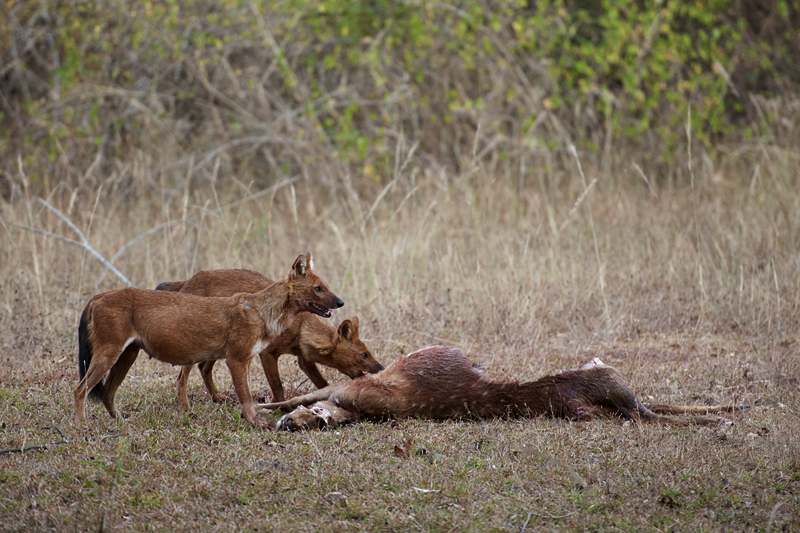 This is the second time we witnessed a pack of Dhole feed on a Spotted Deer. However, the best sighting of Wild Dogs for us will always be the opening post on Walk the Wilderness way back in 2008. Never spotted wild dogs on my safaris. Great “catch”.